Saturn’s moon Enceladus drifts before the rings and the tiny moon Pandora in this view that NASA’s Cassini spacecraft captured on November 1, 2009. 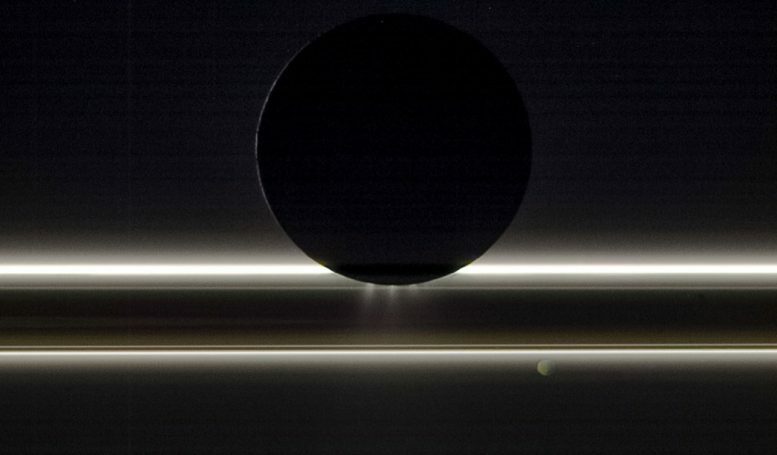 The entire scene is backlit by the Sun, providing striking illumination for the icy particles that make up both the rings and the jets emanating from the south pole of Enceladus, which is about 314 miles (505 km) across. Pandora, which is about (52 miles, 84 kilometers) wide, was on the opposite side of the rings from Cassini and Enceladus when the image was taken. This view looks toward the night side on Pandora as well, which is lit by dim golden light reflected from Saturn. This natural-color image was taken in visible light with the Cassini spacecraft’s narrow-angle camera at a distance of approximately 149,600 miles (240,800 kilometers) from Enceladus and 352,200 miles (566,800 kilometers) from Pandora. Be the first to comment on "A Song of Ice and Light, Enceladus Drifts Before Saturn’s Rings"